The MBH structure. Credit: Huilin Li, Ph.D., Michael W.W. Adams & Hongjun Yu, Ph.D. Ancient microbes that thrive in some of the world's most extreme environments and modern-day humans have more in common than meets the eye—namely, they both respire and conserve energy using a similar molecular mechanism, one that has adapted to changing environmental conditions over billions of years. The findings, published today in Cell by scientists at Van Andel Research Institute (VARI), University of Georgia (UGA) and Washington State University, detail the structure of MBH, a molecular complex involved in microbial respiration. The near-atomic resolution images are the first ever of MBH and show that its structure is remarkably similar to its counterpart in humans, Complex I. "Nature is really good at finding molecules that work and then modifying them and using them over and over again. This is a prime example," said Michael W.W. Adams, Ph.D., a UGA Distinguished Research and Georgia Power Professor who has been studying MBH for 20 years. "Knowing the structure of MBH provides us with new insights into how Complex I evolved and how it might work." Almost all life on Earth relies on respiration, which converts electrical energy into a usable, chemical form. MBH and Complex I are important parts of this process; however, until now, the evolutionary connection between them was unclear. MBH's structure also illustrates a mechanism for transducing electrical energy into chemical energy that is simpler than that in Complex I. "The determination of MBH's structure fills in some important missing pieces that reveal how life adjusted to sweeping changes in the environment throughout the millennia," said Huilin Li, Ph.D., a professor in VARI's Center for Epigenetics and co-senior author on the study. "This solves a fundamental, longstanding mystery in biology." MBH is regarded as an ancient respiratory system because it was isolated from Pyrococcus furiosus, a microbe that grows best in boiling water and that for billions of years has made its home in volcanic marine vents. This inhospitable environment, with its noxious mix of gases and extreme temperatures, is akin to the atmospheric conditions present on a much younger, much more volatile planet. Although many aspects of the two complexes are similar, Complex I boasts several extra loops that allow it to interact with more molecules than MBH, an adaptation that likely arose along with a shift in the Earth's atmospheric makeup. "It is amazing to see these two distantly related systems reorganize their shared elements to adjust to their different living conditions," said Hongjun Yu, Ph.D., the study's first author and a research scientist in Li's lab. "It looks as if nature is playing with its own building blocks." The differences also are reflected in their metabolisms; humans inhale oxygen and exhale carbon dioxide, a conversion helped along by Complex I, while P. furiosus uses MBH to expel hydrogen gas, possibly opening up the potential for its use as a source of clean energy. 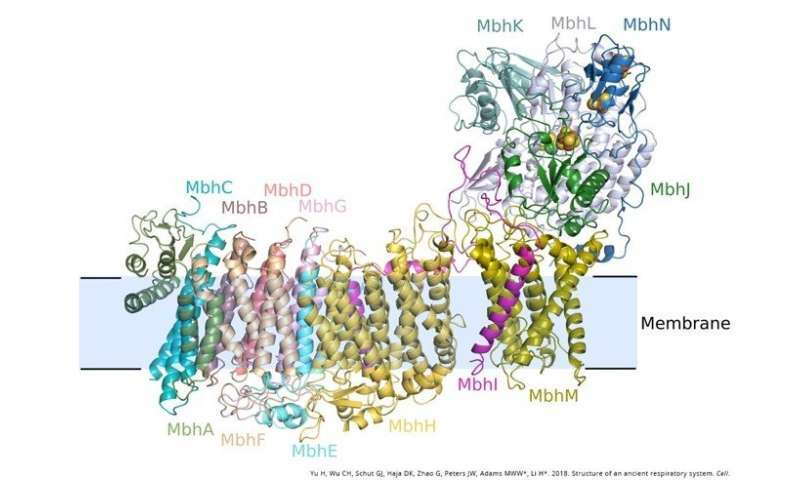 MBH was visualized using VARI's high-powered Titan Krios cryo-electron microscope (cryo-EM), which is capable of imaging molecules 1/10,000th the width of a human hair. The Institute's Krios is one of fewer than 120 such microscopes in the world.